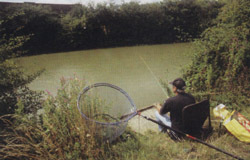 This privately owned 18-peg pool is a highly regarded fishery. It's over 100 years old, well sheltered and retains a good colour throughout the winter. This is a more than useful crucian and tench pool with fish to 1lb 8oz and 5lb respectively - and plenty of them. Also in good numbers are carp to 18lb, bream to 3lb, perch to 2lb 8oz, roach and rudd to 1lb 8oz and the odd decent pike. Tickets are £5 for adults, with winter concessions for OAP's and u16s at £3. In the summer, it's £4. Tickets are available on the bank and they apply from dawn until dusk only. There is disabled access, and small club matches are accepted. To find the fishery, from Sleaford, go south on Mareham Lane then left onto White Cross Lane. Continue on this lane for two miles, over the railway, and the fishery is on your left.